“It’s not about us - it’s about the dignity of our brother ‘travellers”. 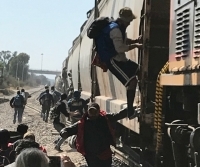 It started when Ignacio heard Central American migrants were waiting at the tracks to jump trains . He and his family took them food, but soon discovered their huge needs .Some were sick, there was nowhere to wash or sleep. So he founded ABBA, where they can rest, receive food and medical and psychological help . The film shows the gap between President Trump calling migrants “rapists and criminals” - and the sad reality. Most are escaping abject poverty and gang violence in El Salvador, Honduras and Guatemala . Their governments - backed by the US for decades, - are enmeshed in endemic corruption The migrants’ dreams of a better life in the USA have been met by tear gas at the border. They are part of a worldwide crisis - 68 million migrants are on the move. The ravages of climate change will create millions more. Yet nations refuse them. Britains’ Brexit aims to ban them. Many Syrians, Afghanis and Iraqis languish in sordid camps in Greece, or are beaten from the borders of Croatia, Hungary and Poland. The irony is that many countries have aging populations and declining birthrates. So immigrants – who do the work that no one wants – are needed. Judy Jackson’s life was threatened many times as she made films documenting dictatorship, torture, disappearance,. Dennis Lanson’s work has appeared on PBS and at many festivals. He is making a film about a dying Newfoundland town,.